My grandmother died of lung cancer. She was a cigarette smoker for over thirty years and smoking ultimately killed her. It was horrible to watch her suffer as she struggled to breathe during her final days. You would think that this experience would have been enough of a deterrent for me to avoid smoking at any cost, but it wasn’t. One day, a friend in college passed me a cigarette and it began my addiction to a dangerous habit. I smoked on an off for about eight years and finally quit, cold-turkey, in 2007. It was definitely a difficult habit to kick but, I am proud to say that I have not smoked a cigarette in almost ten years. Due to my experiences with tobacco, I am constantly warning my high school students about the dangers of smoking. 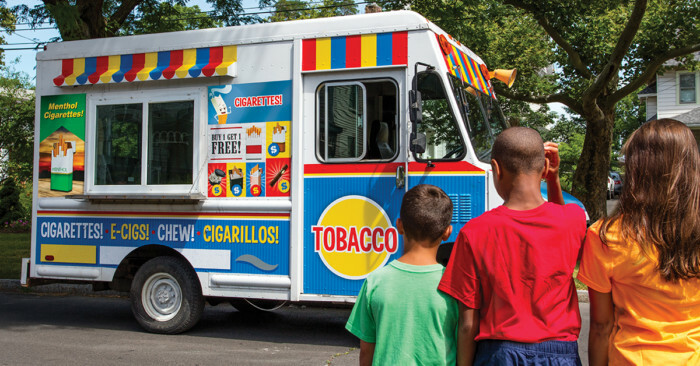 Unfortunately, the tobacco industry spends billions of dollars on promotions, in places where children can see them. They promote cigarettes and smokeless tobacco to young people and funnel a lot of that money into advertising that is geared towards minors. Smoking at an early age is likely to have a detrimental impact on the health of young people. As a matter of fact, 5.6 million children under the age of 18 who are alive today will die prematurely as a result of smoking, including 280,000 children in New York State alone. There is evidence of a relationship between active smoking and impaired lung growth, respiratory symptoms and asthma-related symptoms during childhood and adolescence. Despite these alarming statistics, studies show that the average age of a new smoker is 13 years old, and 90 percent of adult smokers say they first tried smoking by age 18. We are tired of the tobacco industry targeting our children in their ad campaigns! Tobacco Free New York State is working hard to communicate to millions regionally and statewide with its “Seen Enough Tobacco” campaign. 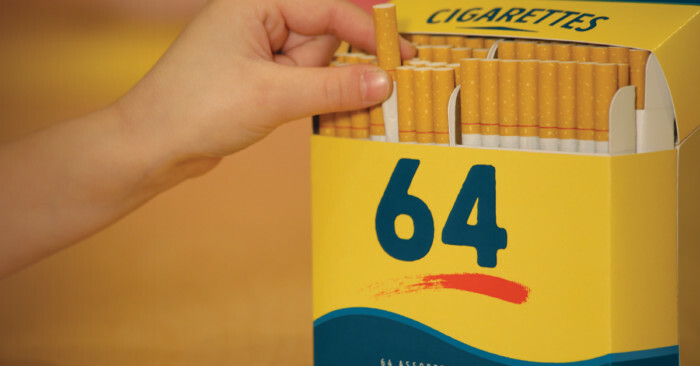 The campaign uses video, social media, digital advertising and a “Jack and Jill (and Tobacco)” storybook that describes children’s experiences with tobacco promotions in their local convenience stores. Their goal is to shield children from the billions of dollars of hard-hitting tobacco promotions in places where they can see them. Viewers can learn what they can do to protect children from tobacco promotions and join more than 15,000 others throughout the state by supporting this initiative. Our kids should grow up without tobacco in their faces. Sign the pledge HERE! Let’s Discuss: What are some of the things that we can do in our own communities to protect our children from tobacco promotions? It’s awful that tobacco companies target kids and make smoking look cool. I think teaching by example is the best way – parents who smoke can’t really preach no smoking to their kids. We have to start with ourselves. I wish everywhere was tobacco free. It’s such a gross habit. I would think the prices of cigarettes would turn people off! 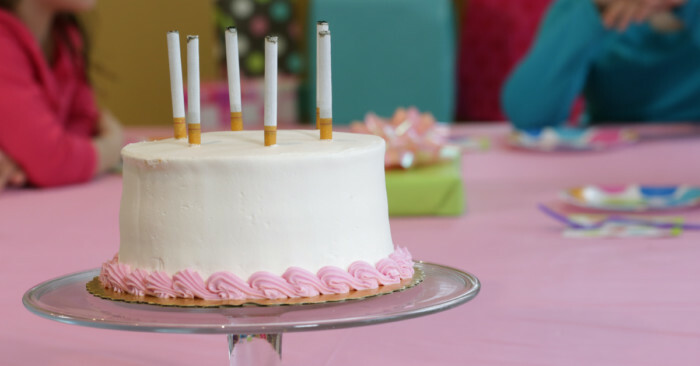 I did not know the average age of a new smoker was 13! Our children are so vulnerable to their advertising and peer pressure. This is a great campaign! I’d love to make everywhere tobacco free! I have never smoked a day in my life and don’t ever plan to. This is an awesome pledge that I hope takes off and ultimately helps keep cigarettes away from kids.. Thanks for this post. I am also concerned about the rising tobacco use among minors. I think the best way we avoid kids from starting the habit is to set a good example. Our homes should be tobacco free too. I understand that tobacco manufacturers have a business to run, and that they need advertising. However, it would be best if they do not put up advertisements near schools, parks, and other places that children frequently go to. Television ads for tobacco should be after 9pm when the kids are already in bed. Active campaigning about the ill effects of the habit should be taught in schools too. Sigh…I am glad you found the strength to stop smoking. What really concerns me is the danger of secondhand smoke…this is unfair. I am truly blessed that my children don’t do drugs, smoke cigarettes or drink alcohol. As a mom, I will advocate for anything that keep children living a happy and healthy life! Smoking is bad for health. None of my family members smoke so I think it all starts from home. Educating children from young about the danger of tobacco is important. I am asolutely against children smoking! My children have always called me a hypocrite however because I do smoke cigarettes. I know I am addicted to them and I have tried to stop smoking many times. The struggle is tremendous and I wish children saw how difficult it is to stop once they start. I’m glad you have joined this initiative. I’m allergic to smoke and so I’ve never tried a cigarette. The city I spent 6 years of my life in, had smoking areas but no smoking in vehicles with anyone under 18 or on the street. It was so wonderful. Being in the states where smoking is rampant is really hard and I would totally support anything to make it smoke-free. We live in Florida, and they have a lot of anti-smoking ads running on the TV all the time. I’m glad! I hate cigarettes! If it’s that addicting, it should be illegal. I taught a lot of kids in my day and I agree that our kids shouldn’t be targeted. I am not aware of any specific campaigns that target kids, but I don’t want there to be any either! I really can’t wait for smoking to be outlawed completely!!! I hate walking in public spaces and having smoke blown on my face – it is just disgusting! I am still so surprised, and my kids are always surprised too, when I see people smoking today, especially around children. Where we live, almost every place is smoke-free and has been for decades, so it surprises us when we see people smoking. My husband’s mother and grandmother both smoked and died of lung cancer. It is such an awful habit and I hope to see it disappear in my lifetime. I cannot believe that more and more children are smoking. It used to be fine because it’s all for the adults. These days though, teenagers smoke as soon as they could get their hands on a stick of cigarette. I do hope we finally become tobacco free if it’s the kids that are being targeted by the ads. I love this initiative! I wish everywhere was tobacco free. They just passed a law here in TN that it’s illegal to smoke with kids under 12 in the car- I think it’s a great idea! While I don’t live in NY, I am a former smoker and I started pretty young. It is a hard habit to break, but it feels so good when you finally do. While I don’t smoke I do know people who do and honestly I don’t think people should be able to smoke in open places because it can make others uncomfortable. If you want to smoke in the safety of your own house that is up to you. I was never tempted to smoke as a kid. My parents always told me it was bad for me. Plus, I had asthma so even the smell instantly gave me a headache or made it hard to breathe. I don’t think smoking is as prominent today since it is banned from many places so I would imagine it isn’t hard to teach children to stay away. I really wish more places would ban smoking in public. Unfortunately my children are exposed to smoke everyday. Our neighbors smoke and it allows gets in through the open windows. It’s really good to hear that you had the strength and courage to quit smoking. One of my pet peeves is the second-hand smoke. I remember growing up when people could still smoke in restaurants – GROSS. (Like the “smoking area” is really going to keep the smoke from wafting over to you!) I think that marketing to kids is just awful. Yes! I could not agree with this post more. I love this initiative and I truly hope that it gets adopted by every place. Smoking is not just dangerous to the smoker, it can harm people around you. I really hate seeing people who expose their children to smoking. It’s not fair to them to have to suffer the risk. I think more places need to be smoke-free as I’m always walking around/ in parks and can smell smoke everywhere. I agree kids should be able to grow up without the brainwashing of marketing. Great post! I hope we see tobacco go away in our lifetime! I wish it still wasn’t around going after our kids. Le sigh. We are very open about talking about this topic. A lot of our family members used to smoke so we openly talk about how bad it is for you. I personally would love to be done away with tobacco and alcohol. I think the world would be a much better place if both weren’t so easily accessible. My mom died of lung cancer, and honestly think she’d still be here today if she didn’t smoke so much! I think making healthy habits a priority and being open about the effects of tobacco are essential in every family! We should make the world tobacco-free! I am so sorry for your loss! You know what is the biggest irony about all these tobacco brands? Do you remember that masculine Marlboro man? Well, he died of lung cancer in 2008! This is an awesome campaign that’s going on right now! I grew up with my parents smoking and to this day, I can’t stand the smell. I think there is a lot of educating to be done about tobacco and this is great!